Half an hour east of Bunbury in the rolling green hills of the Ferguson Valley is perhaps the most unexpected attraction you'd imagine tucked into the forest on the side of the road. Quite fittingly, Gnomesville was born out of a very unique method of protest to development. The round-a-bout that signals your arrival to the area was opposed by locals when construction was announced. 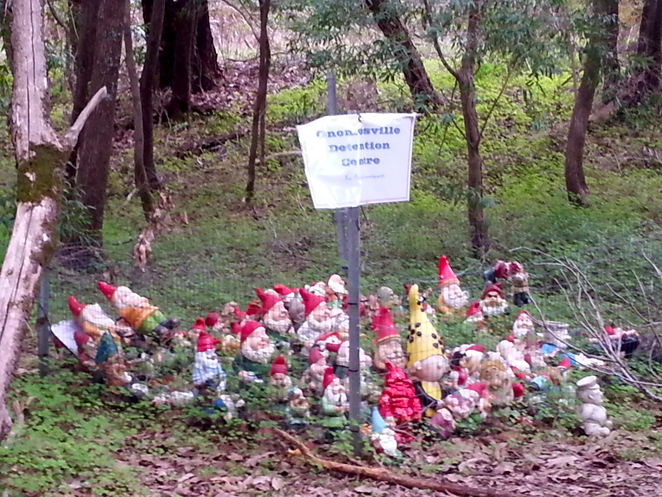 With no social media or internet to drum up support some of the locals placed garden gnomes on the side of the road to show their frustration. Today there's over 3000 gnomes and counting. 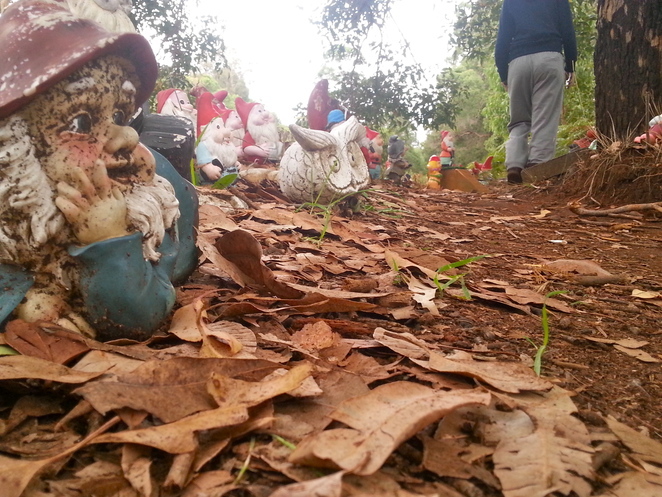 Nestled into 500 square metres of idyllic Ferguson Valley forest the "gnomers" (the name given to anyone who puts a gnome here) have turned a usually unnoticed and annoying garden item into a living community full of character. There's ninjas, town drunks, pilots (in planes! ), sports teams, hotels, wealthy estates, lifestyle villages, tourists and even a detention centre. Gnomesville has every type of character you could possibly find in your own human-populated town. It's easy to see why the gnomes decided to settle here. The lush green forest features much of what you can see on a grand scale throughout the Ferguson valley. Mini rolling hills, lakes, valleys, forest, bushland and even a quiet river ambling it's way down the middle of the settlement. The best thing about Gnomesville is the puns. Almost every Gnome related pun has been thought of by gnomers including "World Gnomination" "Phegnomenon" "On the road to Gnomewhere" and "Gnoman Empire". Walking trails take you to all corners of Gnomesville and an unsealed car park besides the round-a-bout makes access easy for passers-by. There's wooden tables and plenty of shade to make for a pleasant picnic spot as well. At the interesction of Ferguson, Wellington Mill and Wellington-Lowden roads. 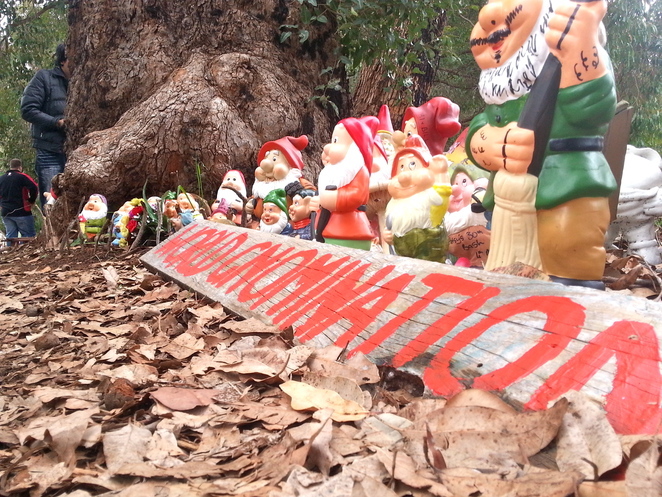 Whether you're travelers, couples, families, teams, friends or groups adding your own gnomes to the town is most welcome. The village is ever expanding and there's plenty of prime real estate left for anyone with a creative mind. 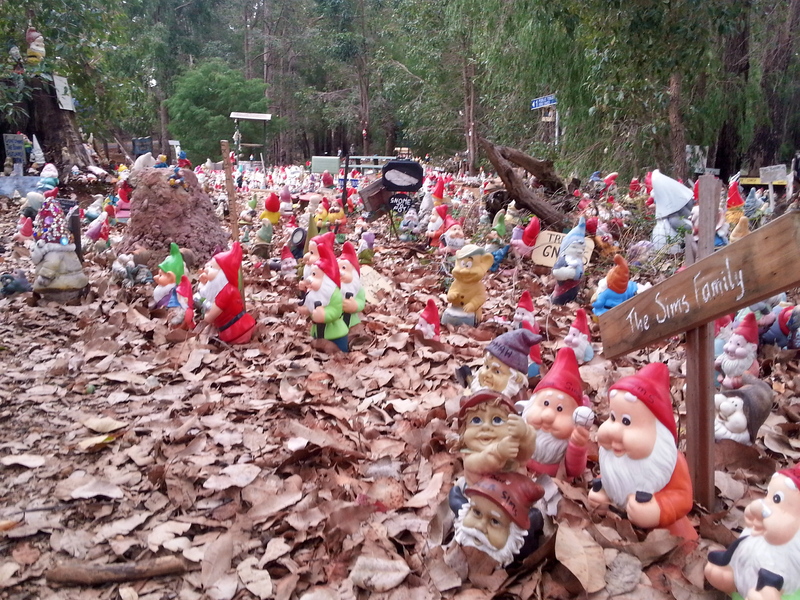 Gnomesville is open to anyone 24/7 365 days a year and is 100% free to visit or add to the collection. There's breweries, bakeries and cafes in nearby towns and Donnybrook is just around the corner. 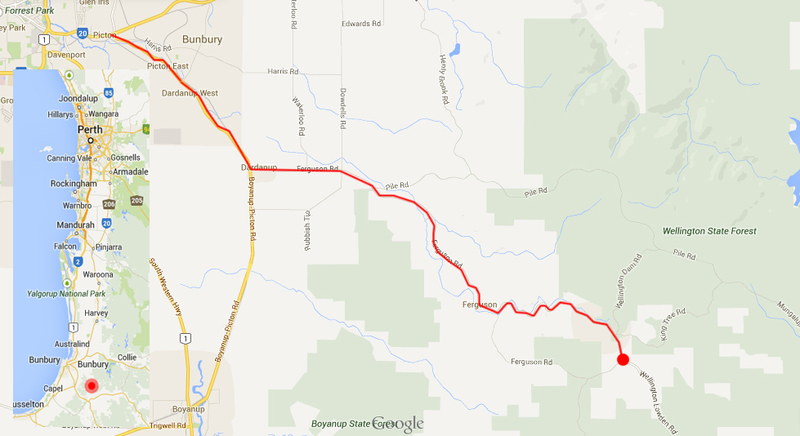 Anyone traveling down south with a bit of spare time should stop by to see this truly unique corner of the world. The drive in through the Ferguson Valley is picturesque, the destination is out of this world. Gnomesville is a place that can put a smile on anyones face - even those who usually despise the existence of these plucky gnome-ads. What a quirky place to visit. It reminds me of an advert over here, where a family is at war with the gnomes in their garden.